Alice Theresa (Rafferty) Lightcap was married to Albert “Bert” Lightcap, brother of my great-grandfather Ernest Edward Lightcap. She lived in Hammond, Indiana, for the last 30 years of her life. A former resident of North Judson, Indiana, her obituary appeared in the North Judson News on October 27, 1938. I received this obituary from my mom. “Mrs. 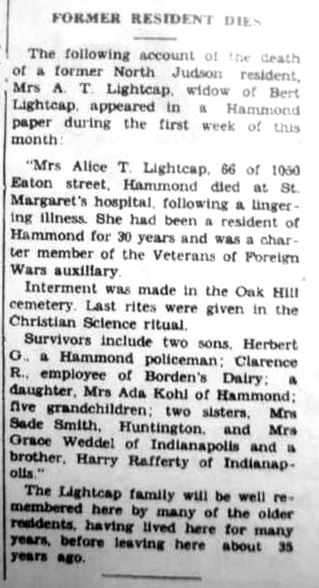 Alice T. Lightcap, 66 of 1050 Eaton street, Hammond died at St. Margaret’s hospital, following a lingering illness. She had been a resident of Hammond for 30 years and was a charter member of the Veterans of Foreign Wars auxiliary. The Lightcap family will be well remembered by many of the older residents, having lived her for many years, before leaving hear about 35 years ago.